The club arrived at the Isles of Glencoe on a beautiful cold starry night for the annual dinner meet. Mike and Fiona enjoyed the drive up so much they decided to go all the way back to Edinburgh again on the pretence of having forgotten a rucksack and then drive back up to Glencoe, eventually arriving at 1am by which time the rest of us had had a few drinks and gone to bed. After a fine breakfast on Saturday various parties set off to see just how much snow there actually was on the hills, a lot was the answer. Mike & Fiona having not had as much sleep as the rest of us set off to bag the munro top on Sgurr na h Ulaidh and enjoyed the floundering in the deep snow in the corrie so much they decided to retrace their steps down and ascend via a different route to gain the top. Further up the Glen, myself, Anne R, Kenny and Anne C made for the wee Buachaille applying the logic that given the popularity of this fine hill we wouldn’t need to break trail and so it proved and the conditions were almost alpine at times. Rebecca and Ali made for Stob Ban in the mamores and thoroughly enjoyed their descent through the trees at the end and further to the east in the mamores, Emma, Kate, Allan S and Alison F headed up Sgurr Elide Mor. Gillian, Margaret and Fiona C headed up the Pap, the two Cla(i)res headed for the Ballachullish horseshoe with Emily, Victoria and Marlene but were thwarted by deep snow, Claire returned and promptly romped up the Pap while t’other Clare made do with a swim in the Loch, the hotel pool being far too warm! Paul did a traverse of the Corbett Mam na Gualainn where he was chastised for his navigation and trail breaking prowess which seemed a tad harsh given the individual concerned was happy to follow! Bill & Eileen floundered up the two Grahams just south of the hotel and in summary we all had a great winter day on the hill. Alison met up with Fiona M for the first winter climb of the season and climbed the South West ridge (IV, 5) on the Douglas Boulder on the Ben using the key for the North Face car park for the first time which Alison reported as being a godsend on the way back - http://www.edinburghmc.org.uk/benkey.pdf for details about how to obtain the key. The evening passed by in the pool, at the bar, followed by a lovely meal where we were also honoured by the presence of Allan H, I muttered a few words as El Presidente and then back to the bar again for beer and whisky. Very pleasant and it was agreed by all this was an excellent venue for the annual dinner. 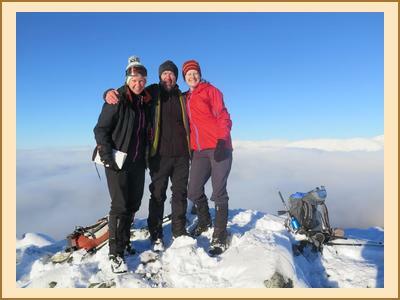 The next day was more of the same, Gillian and Margaret cursed themselves for going to Ben Ledi and being in thick mist, only to emerge from the mist to clear skies and snowy peaks where after they promptly congratulated themselves on such a good choice of hill! 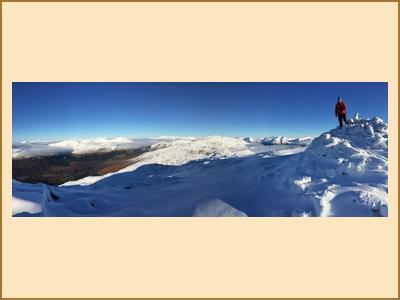 Mike & Fiona headed to Beinn Sgulaird and in a first for the weekend didn’t have to retrace their steps at all! Kate, Allan and Alison F were on the Corbett on the west side of Glen Orchy, the Pap was ascended again along with the aonach eagach munro, Claire & I had a wee run with a very cold river crossing and Emma and Fiona C had a glorious day on the wee Buachaille. Finally, this was the first club meet since the tragic death of Martin and everybody shared their fond memories of him over the course of the weekend. He will be sorely missed on future meets but his enthusiasm and love for the hills will live on in all of us within the club and we will treasure those memories we have of sharing time in the hills with him.